I recently went looking for a script that would compare two “identical” certificates for me and highlight the differences between them. I drew a blank. It might be out there, but I missed it – so I wrote my own. 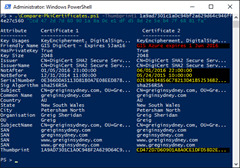 “Compare-PkiCertificates.ps1” takes the thumbprints of two certificates you expect to be similar or identical, and uses your existing PowerShell colour scheme to show you where they differ. Your environment’s Warning colour (yellow in my screen-grab below) shows the bits we expect to be different (the “not before”, “not after”, “serial number” and “thumbprint” values) whilst your Error colour (red below) shows the “unexpected differences” like extra or missing SANs, changes to the key size, etc. PS C:\> .\Compare-PkiCertificates.ps1 -Thumbprint1 "?e9 6e 65 bc 08 0f 0b 34 94 a4 30 d5 ea 9f 2d 0a 1a fd a5 99" -Thumbprint2 "?22 c8 ee e1 f1 e9 3d 7b 38 5d 4e d9 25 f4 bc 79 00 bf 8a 3b"
PS C:\> .\Compare-PkiCertificates.ps1 -Thumbprint1 "e96e65bc080f0b3494a430d5ea9f2d0a1afda59" -Thumbprint2 "22c8eee1f1e93d7b385d4ed925f4bc7900bf8a3b"
Found the v1.3 change to reading certs was causing some values not to show in some environments & errors in others. Reverted to the v1.2 approach (but now reading all of cert:\localmachine) pending further investigation. Updated the script so it searches all Cert stores for the thumbprints you nominate, not just “localmachine\My”. Thanks Soder! Changed the script comparison engine to take full advantage of your current visible screen width. Changed the way I read SANs for improved Server 2008 compatibility. I dont see any reference whether it supports certificates only in the COMPUTER container or does it support also lookup in the CURRENTUSER / SERVICEUSERS containers etc.? With my perhaps narrow SfB/Exchange focus I assumed a use-case of only the “cert:\localmachine\My” store (Lines 196 & 197), but as you’ve correctly suggested, why should I limit it to that? 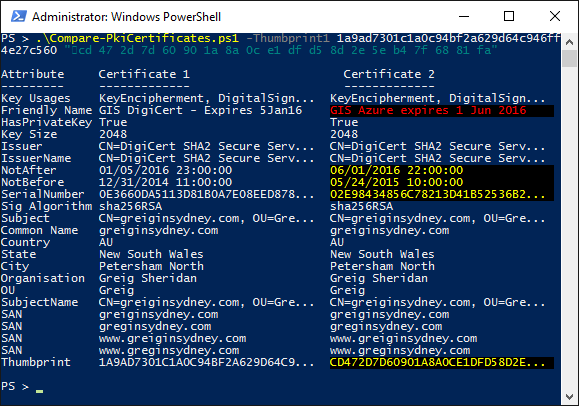 I’m currently working on an update to its sister script (update-SfBCertificate) but I’ll add a query of the CurrentUser store to the next update. 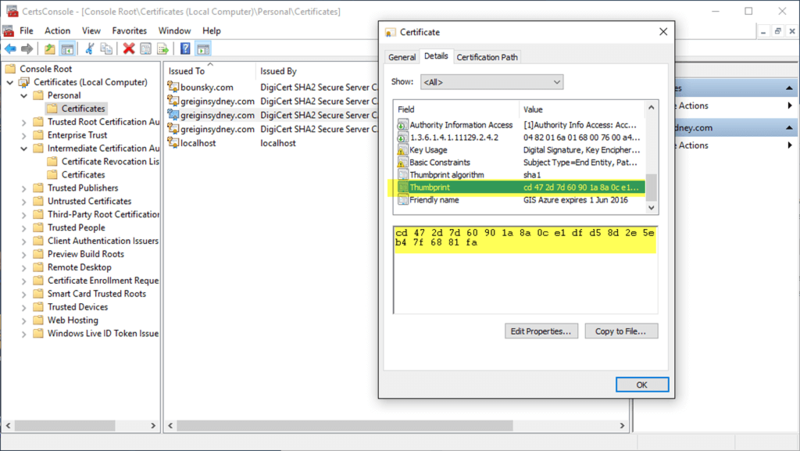 No worries, for Sfb/Exchange you are (AFAIK) correct that certs should only live under CoMPUTER, but to be more flexible I think it isnt a big change to handle any cert container, dare we use it for another cert comparison as well. Well that turned out to be remarkably simple to fix! I’ll test the update on some SBAs and more in the coming week and release it. Thanks again for pointing it out. Greatly appreicated your quick act.